In the cold New York winter months, my apartment is sub-tropical in temperature due to the way old buildings here are heated (steam heat). As Boyfriend puts it, "Even if you fire to everyone on the ground floor, people on the sixth floor will complain it's too cold." And what can you make when the temperature in the apartment hovers around 80° F? Bread. 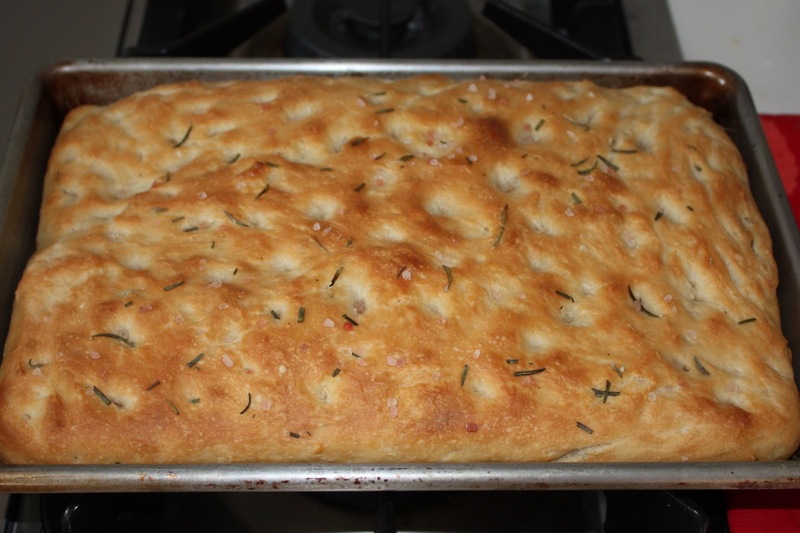 This recipe is a more specific version of my herb focaccia. Yields one 9 by 13-inch bread. In a large bowl or stand mixer, whisk together the flour, iodized salt, and olive oil. The flour should look slightly sandy or lumpy, but not wet. Add 2 teaspoons of fresh rosemary, reserving the rest for later. Whisk or stir until they are distributed evenly. Add the yeast mixture to the flour and stir it with a wood spoon until it is tacky. The dough should be messy and a little wet. Turn the dough out onto a clean and lightly floured work space to knead for about 5 minutes (or set the stand mixer to knead). Tip: When kneading by hand, concentrate more on keeping your hands dry with the a little extra flour, rather than thinking about keeping the dough dry. The dough should be warm, sticky, and elastic. If your hands are dry, they won't stick to the dough. Take a new bowl, preferably a ceramic one, and rinse it under hot water to take the chill off. Dry thoroughly. Pour about 1 tablespoon of the olive oil into the bowl. Place the dough ball into the oil and turn to coat. Cover loosely with plastic (either plastic wrap or a plastic shopping bag) or a damp towel and leave it to rise in a warm place for about two hours. Punch down the dough gently. Cover the dough again loosely and leave it to rise for an hour or so. showing this sunny spot in my kitchen reached 91.8 degrees F! Grease or oil a 9 by 13-inch, or quarter sheet pan, baking dish. 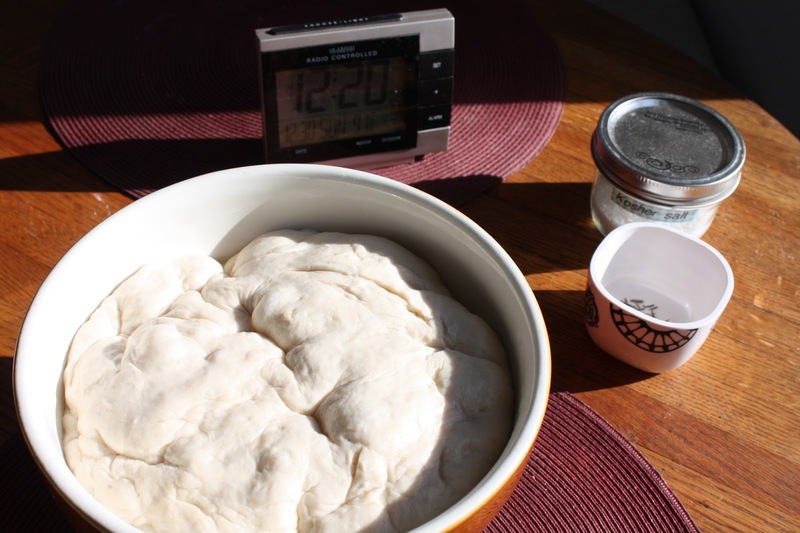 (I've successfully made this bread in a deep 8 by 8-inch dish, as well as a 9-inch pie plate). Turn the dough out into the dish and use the tips of your fingers to gently press it toward the edges, dimpling the dough as you go. Brush the remaining 2 tablespoons olive oil onto the top of the bread. It will collect in pools in the dimples. Sprinkle with the remaining rosemary and 1 teaspoon coarse salt. Leave the dough in a warm place (like on top of the oven while it preheats) for 10 to 15 minutes, or until it begins to rise again. Bake it in the center of the oven for about 5 minutes, then lower the temperature to 425 °F, and continue baking until it’s barely golden brown on top.